A climbing vine, herbaceous above, usually somewhat woody and perennial below, smooth or pubescent, branching, 2 to 8 feet long. Leaves petioled, ovate or hastate, three-lobed or sometimes entire or only two-lobed, with the terminal lobe much the largest, the margins otherwise entire, 2 to 4 inches long, 1 to 21/2 inches wide with a pointed apex. Flowers arranged in compound lateral cymes on slender, drooping stalks. Calyx five-cleft; corolla blue, violet or white, about one-half of an inch broad, rotate, five-lobed, the lobes triangular-lanceolate, slender pointed and curved backward. Stamens five; attached to the throat of the corolla, their filaments short; the anthers long and narrow, united to form a cone. Berry oval or globose, turning from yellow to orange and finally becoming bright red. In waste places or moist woods and thickets, Nova Scotia to Minnesota and Washington, south to New Jersey, Pennsylvania and Kansas. Native of Europe, but thoroughly naturalized in our eastern states. 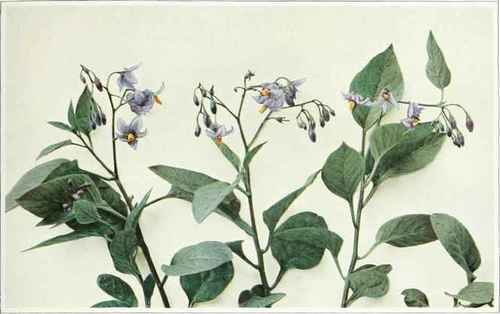 The genus Solanum contains a number of cultivated species, weeds and adventive plants. The Black, Deadly or Garden Nightshade (Solanum nigrum Linnaeus), with white flowers and black berries, is a common weed almost everywhere. The Sand Brier (Solanum Carolinense Linnaeus) has prickly stems and leaves and smooth, orange-yellow berries. The Sand Bur (Solatium rostratum Dunal) has yellow flowers about an inch broad, prickly stems and leaves and the berry inclosed by the prickly, enlarged calyx. The Potato (Solanum tuberosum Linnaeus) is also a member of this group, while the Tomato is classed in the related genus Lycopersicon.